Intel recognizes that water is a critical natural resource that is of strategic importance to our business and the communities in which we operate. We acknowledge the importance of having guiding principles in terms of our responsible use and preservation of this vital resource. Our commitment to environmental stewardship—including responsible water management—is ...embodied in both Intel’s Environmental, Health & Safety Policy and in the Intel Code of Conduct, which asks employees to consider both the short and long-term impacts to the environment and the community when making business decisions. • Safety: Commit to preserve the quality of water resources we utilize in the communities where we operate. • Sufficiency: Strive to operate in a manner that minimizes impact from our operations on the availability of community water resources. • Transparency: Openly communicate and engage with our communities regarding our water usage and conservation initiatives in an ongoing manner. • Physical Accessibility: Work to ensure that our operations do not adversely impact physical accessibility of community members to water resources. • Responsibility: Consider the impact on water throughout all stages in our operations, including: reviewing access to sustainable water sources as a criterion when selecting a site for a new Intel facility, incorporating water conservation elements into the design of our facilities, and establishing specific water goals for new process technology changes in an effort to support a safe, consistent, adequate and affordable water supply in line with local practices. 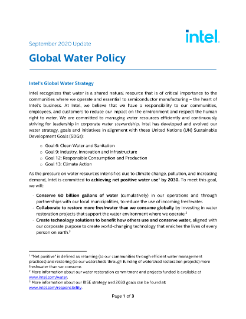 Read the full Intel Water Policy Paper.